As the end of the year is approaching, I think it’s time to draw some conclusions from the stats of this blog. Here is the list of the top 10 posts in terms of visits since they have been posted. (mainly on MDD, MDA, BPM, Social Business and Social BPM). Although the publishing date must be taken into account, I think that one trend is quite evident: general posts on world-wide events are much more popular in terms of visits with respect to specialist-oriented posts that discuss domain-specific or controversial / research issues. This is also because these posts are more likely to be shared and linked in popular sites, possibly. Well, we know we work on niche discussion topics wrt the mainstream Web users. I think the main purpose of a blog like this is to raise the discussion between experts, and only later possibly to share the arising knowledge with the general public. That’s why I think this mix is definitely interesting and I’m very satisfied with the current fruition of the contents. The general interest in this blog is steadily increasing, as shown by the following graph of total number of pageviews. 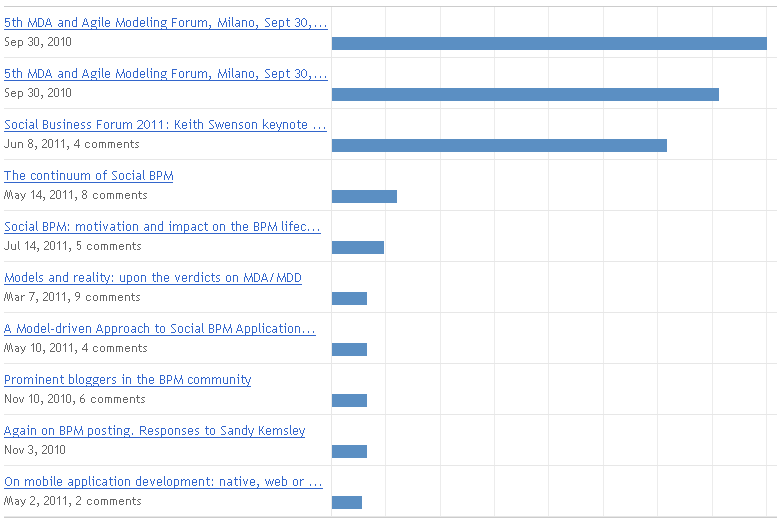 The increasing popularity of my ModelDrivenStar blog during its 2.5 years life. I hope that next year will bring further interest and many more reader on board. Happy new year to all of you (and to your blog, if you have one)!